Charter Flight Group specializes in arranging private jet charter flights in and out of Republic Airport (FRG) in Farmingdale, New York, to accommodate your busy schedule. Our thirty years of aviation expertise makes us uniquely qualified to provide private jet services and business jet travel anywhere in the world. We offer the best private jets to suit all of your needs. We makes the private jet charter process easy and provide you with the newest and safest private aircraft in the industry today. Our extensive and diverse fleet of private jets includes the small, four-passenger Eclipse 500, the mid-sized, medium range Lear 60, the twin-engine Falcon 2000 business jet, and the ultra-long-range Global Express. Charter private jets with CFG, a distinguished leader in private charter aircraft, and gain access to executive airports worldwide. Farmingdale’s Republic Airport is located on Long Island and provides convenient access to the NY Route 110 Business Corridor. CFG is available around the clock to arrange your corporate or personal travel in and out of Republic Airport. We require our global partners to meet the stringent Federal Aviation Administration (FAA) Part 135 standards for aviation operation, aircraft maintenance and licensing. Global aviation safety leaders Aircraft Research Group of the United States (ARGUS) and WYVERN perform third-party safety audits on every one of the private jet charter flights we arrange. CFG is committed to your safety and we expect our partners to maintain flawless safety and maintenance records. Republic is a busy general aviation airport located in the heart of Nassau and Suffolk counties on New York’s Long Island, a mere one hour from New York City. Republic began operations in 1928 as a testing field for aircraft from Fairchild, American, Grumman and Seversky. It became a general aviation airport in 1966, and has become a favorite of recreational travelers and business executives who want to avoid the congestion of La Guardia, John F. Kennedy International, and Newark International Airports. On-demand private charter flights in and out of Republic Airport can take place 24 hours a day. Clients chartering private aircraft to and from Republic will find this expansive airport (526 acres) to be a very convenient entryway to the Manhattan area from both foreign and domestic destinations. Downtown New York can be reached from the Long Island Railroad station in the Village of Farmingdale. Republic Airport also serves private air charter passengers headed to Atlantic City and other short distance destinations in the region. Charter Flight Group will customize your travel arrangements to fit your individual requirements. Private jet charter flights to Republic Airport in Farmingdale, New York, will put you within an hour of the center of New York City. Business travelers can take advantage of easy access to Wall Street, the New York Stock Exchange, the new 7 World Trade Center building (rebuilt in 2006), more than 45 of Fortune 500’s U.S. corporate giants, and multinational media conglomerates. If you are chartering private jet services for recreation or pleasure, Republic Airport places you within easy reach of Long Island’s world-renowned white sand beaches, scuba diving and some of the best fishing in New York. Enjoy seal-watching in the winter and whale-watching in the summer. 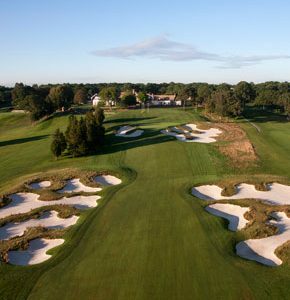 Reserve a tee time at some of New York’s best golf courses (Long Island boasts more than 60). Discover area wineries or explore Long Island’s historic sites, such as Cedarmere, former home to poet and journalist, William Cullen Bryant. Of course, all of the famous New York City destinations are also within a short drive. Before you leave the Republic Airport grounds, visit the American Airpower Museum where you can see and hear World War II aircraft in flight. Aviation enthusiasts will appreciate the Museum’s tribute to the airport’s former occupant, Republic Aviation, which built thousands of P-47 Thunderbolts in Farmingdale during the war. Why Choose Charter Flight Group for your Jet to Farmingdale, New York? Arrange your private charter flights to and from Republic Airport in Farmington, New York, with Charter Flight Group. Our expert consultants and charter planners are dedicated to making your worldwide private jet charter flights exceptionally safe and convenient. You will always have the most experienced pilots and private aircraft maintained by certified professionals. Whether you are headed to Republic in Farmingdale for business or pleasure, Charter Flight Group will offer you the best private jets and the highest level of professionalism and reliability.